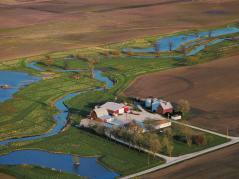 URBANA, Ill. - University of Illinois Extension has received a five-year, $1.5 million grant from the Illinois Environmental Protection Agency to help farmers and landowners reduce nutrient loss into Illinois waterways. Extension will use the award to hire two watershed coordinators, who will work in high priority areas and help producers implement best management practices identified in the Illinois Nutrient Loss Reduction Strategy. The watershed coordinators will focus on four high priority Illinois watersheds beginning in early 2018. A coordinator in the Embarras River and Little Wabash River watersheds will work closely with farmers to reduce nutrient loss, with an emphasis on phosphorus. In the Lower Rock River and Mississippi North Central River watersheds of northwestern Illinois, a coordinator will work to reduce nutrient loss, with an emphasis on nitrogen. Members of the agricultural community have already been heavily involved in nutrient loss education, reaching nearly 39,000 people at agricultural outreach events in 2016. According to the USDA, 70 percent of Illinois farmers were aware of NLRS conservation practices in 2016. The grant to Extension also provides funding for an agricultural water quality science team composed of researchers from the University of Illinois College of Agricultural, Consumer and Environmental Sciences. The team will provide technical support and serve as a university resource to help develop new approaches for protecting water quality, and include faculty Laura Christianson, Reid Christianson, Cameron Pittelkow, and Maria Villamil in the Department of Crop Sciences; Jonathan Coppess in the Department of Agricultural and Consumer Economics; Paul Davidson in the Department of Agricultural and Biological Engineering; and Suzanne Bissonnette, assistant dean of Agriculture and Natural Resources in Extension.